The National Personnel Records Center Military Personnel Records (NPRC-MPR), in St. Louis, MO, is the repository of millions of military personnel, health, and medical records of discharged and deceased veterans of all services during the 20th century. NPRC (MPR) also stores medical treatment records of retirees from all services, as well as records for dependent and other persons treated at naval medical facilities. Copies of most military and medical records on file at NPRC (MPR), including the DD Form 214, Report of Separation (or equivalent), can be made available upon request. Veterans and "Next of Kin": Veterans and next-of-kin of deceased veterans have the same rights to full access to the record. Next-of-kin are the un-remarried widow or widower, son or daughter, father or mother, brother or sister of the deceased veteran. Authorized Representatives: Authorized third party requesters, e.g., lawyers, doctors, historians, etc., may submit requests for information from individual records with the veteran's (or next of kin's, for deceased veterans) signed and dated authorization. If you use a signed authorization, it should include exactly what you are authorizing to be released to the third party. Authorizations are valid one year from date of signature. General Public: The general public can also request some parts of a veteran's military record without the authorization of the veteran or next of kin. The Freedom of Information Act (FOIA) and the Privacy Act provide balance between the right of the public to obtain information from military service records, and the right of the former military service member to protect his/her privacy. In general, information available from military service records which can be released without violation of the Privacy Act are: Name, Service Number (not Social Security Number), Rank, Dates of Service, Awards and Decorations, and Place of Entrance and Separation. If the veteran is deceased, the Place of Birth, Date of Death, Geographical Location of Death, and Place of Burial can also be released. Court Order: Access to military personnel and medical records on file at the National Personnel Records Center, may also be gained pursuant "to the order of a court of competent jurisdiction." Subpoenas qualify as orders of a court of competent jurisdiction only if they have been signed by a judge. To be valid, court orders must also be signed by a judge. Authority for these requirements is 5 U.S.C. 552a(b) (11), as interpreted by Doe vs. DiGenova, 779 F. 2d 74 (D.C. Cir. 1985), and Stiles vs. Atlanta Gas and Light Company, 453 F.
Military personnel records for individuals separated before these dates are on file at the National Archives and Records Administration, Old Military and Civil Records Branch (NWCTB), Washington, DC 20408. Federal law (5 USC 552a(b)) requires that all requests for records and information be submitted in writing. The easiest way to do this is by using Standard Form (SF) 180, Request Pertaining to Military Records. Requests must contain enough information to identify the record among the more than 70 million on file at the National Personnel Records Center. The Center needs certain basic information in order to locate military service records. This information includes the veteran's complete name used while in service, service number or social security number, branch of service, and dates of service. Date and place of birth may also be helpful, especially if the service number is not known. If the request pertains to a record that may have been involved in the 1973 fire, also include place of discharge, last unit of assignment, and place of entry into the service, if known. The SF 180, although not mandatory, is the recommended method to send a request for military service information. This form captures all the necessary information to locate a record. Provide as much information on the form as possible and send copies of any service documents that you may have. Requests may also be submitted as a letter, containing the basic information listed above. Veterans and "Next-of-Kin" can now complete a records request online. One must still print out and sign a sign a signature verification, and mail or fax the verification because Federal Law requires a signature on all records request. However, completing the application online can be easier and faster than completing the SF Form 180. Those who are not veterans or next-of-kin, cannot use the on-line system. They must complete the SF 180. NAME OF THE LAST FACILITY WHICH HAD RESPONSIBILITY FOR THE TREATMENT RECORD. Usually, this is the last facility at which treatment was provided. The YEAR and the TYPE OF TREATMENT (inpatient, outpatient, dental, mental health, etc.) If you need copies of specific records, please be sure to state the type of illness, injury, or treatment involved. The patient's SOCIAL SECURITY NUMBER and STATUS during treatment [military, retiree, dependent of military, federal employee, dependent, or other (specify)]. BRANCH OF SERVICE and SPONSOR'S SERVICE NUMBER or SOCIAL SECURITY NUMBER (if the former patient is/was a dependent). Veterans who plan to file a claim for medical benefits with the Department of Veterans Affairs (VA) do not need to request a copy of their military health record from the National Personnel Records Center. When you file a VA claim, the Department of Veterans Affairs will request the record automatically, as part of the claims process. Generally, there is no charge for military personnel and health record information provided to veterans, next-of-kin, and authorized representatives. If your request involves a service fee, you will be notified as soon as that determination is made. It wasn't all that long ago when turnaround time for military records was miserable. It was not unusual for a simple DD Form 214/215 request to take up to 180 days. NPRC has transformed the way it responds to inquiries, to provide dramatically improved customer service. This Business Process Reengineering project has changed structures and systems that in some cases have been in place since the center was formed 40 years ago. As a test, I requested a copy of my DD Form 214 in December 2003, using the on-line system. I was pleasantly surprised to receive my DD Form 214 copy in just 18 days from the date of my request. However, the folks at NPRC are still busy animals. They process nearly 20,000 requests per week. Turnaround times for records requested from the National Personnel Records Center (NPRC) vary greatly depending on the nature of the request. For example, requests that involve reconstruction efforts due to the 1973 fire may take much longer. Health records cover outpatient, dental, and mental health treatment which a former member received while in the military service. Health records documents include induction and separation physical examinations and routine medical care (doctor/dental visits, lab tests, etc.) when the patient was not admitted to a hospital. In comparison, clinical (hospital inpatient) records are NOT filed with the health records but are generally retired to National Personnel Records Center by the facility which created them. After the dates shown on the chart above, the Department of Veterans Affairs (VA), Records Management Center , St. Louis, MO, maintains the active duty health records or manages their whereabouts when on loan within the VA. Call the VA toll free number at 1-800-827-1000 to identify the current location of specific health records and to find out how to obtain releasable documents or information. Clinical (inpatient) records are compiled when members are actually hospitalized while in the service. An overnight stay or admission generally makes a patient an inpatient. The resulting records from hospital care are called either clinical or inpatient records. Clinical (inpatient) records are filed at NPRC by the name of the hospital in which the member was treated. Therefore, NPRC needs the name of the hospital, month (if known) and year of treatment, as well as the veteran's name and social security or service number to locate a clinical record. Clinical records are retired to NPRC in annual collections by the creating hospital. Army and Air Force records are retained one calendar year and Navy records are retained two calendar years before retirement. Teaching hospitals that maintain Clinical Record Libraries may retain records up to 5 years before retirement to NPRC. NPRC stores records of inpatient, outpatient, dental, and mental health treatment provided to military retirees. These records reflect health care for former members during their retirement years and do NOT include active duty medical records. Some record collections date from the 1940's and 1950's, but more comprehensive information exists beginning in the 1960's. The retiree records are sent to NPRC (Military Personnel Records Section) from facilities of all military services generally after 1-5 years of inactivity and are retained for 50 years from the year of last patient activity. Prior to 2003 the Army, Navy and Air Force retired their retiree records to NPRC (MPR). Beginning in 2003 the Army and Navy retired their retiree records to NPRC (MPR), but the Air Force began retiring their retiree records to NPRC (Civilian Personnel Records Section). If possible, contact the last medical treatment facility to determine if records have been retired to NPRC before sending a request. NPRC (MPR) stores records of inpatient, outpatient, dental, and mental health created at medical treatment facilities of the U.S. Navy. Some record collections date from the 1940's and 1950's, but more comprehensive information exists beginning in the 1960's. These Navy medical records are sent to NPRC (MPR) generally after 1-5 years of inactivity and are retained 50 years from the year of last patient activity. If possible, contact the last medical treatment facility to determine if records have been retired to NPRC (MPR) before sending a request. 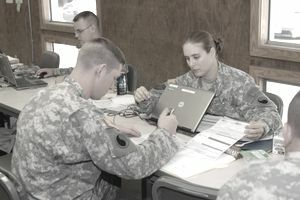 Medical records of individuals treated at Army and Air Force medical facilities are stored at two separate locations within the National Personnel Records Center. Prior to 2003, the Army and Air Force retired medical records of this type to NPRC (CPR). See below (Dependent Medical Folders), for complete information and requesting procedures concerning medical records retired prior to 2003. Beginning in 2003 NPRC (CPR) continued to receive Air Force Dependent Medical records, but the Army began retiring their medical records for dependents and others to NPRC (MPR). If possible, contact the last medical treatment facility to determine if records have been retired to NPRC (MPR) before sending a request. The National Personnel Records Center, Civilian Personnel Facility stores dependent medical folders (DMFs) for dependents treated at Army, Air Force, or Coast Guard facilities from 1954 to the present. Records prior to 1954 were destroyed in accordance with legal authorities in effect at the time. (DMFs for dependents treated at Navy facilities are stored at the National Personnel Records Center, Military Personnel Facility.) DMFs are transferred to the center between one and five years after last treatment. To request information from a DMF, follow the steps below. STEP 1 - Provide written authorization. If you are not the subject of the file, send a letter signed by the subject indicating that he/she authorizes the NPRC, CPR to release information to you. STEP 2 - Provide information necessary to identify the file. The search for the file will be expedited by as complete information as possible. Is it Possible to Upgrade Your Military Discharge?